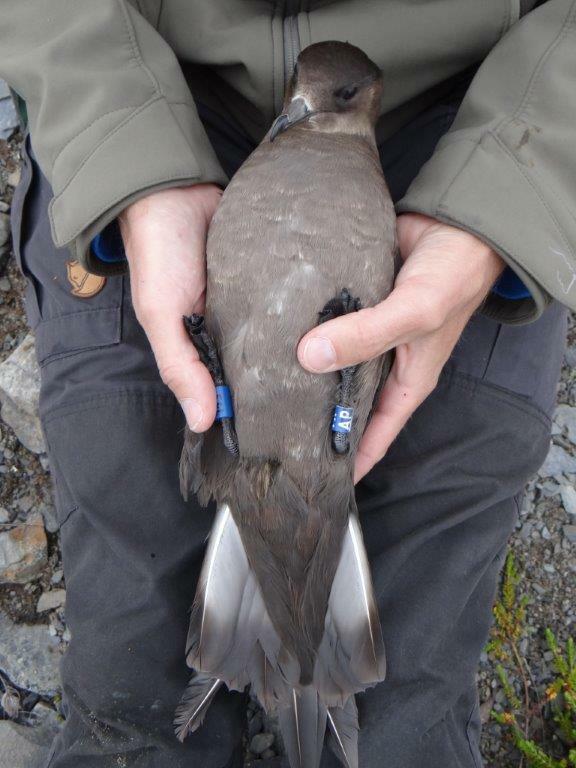 Arctic Skuas are colour-ringed at Slettnes using blue darvic rings with a two-alpha code. Most rings should read downwards, but some read upwards. A small number of these rings has been used at Tobseda, Russia, where also red rings using a three-digit alphanumeric code have been used (starting with ‘X’ and followed by two numbers). Virtually all of these red rings have been taken off in 2015; only one or two individuals with red rings might be still alive and kicking. In 2016, yellow rings with a two-alpha code have been deployed on the Faroe Islands (Sjurdur Hammer). In a fair number of individuals at all these localities, a geolocator has been attached to the other leg using a plain blue darvic ring.